Ecosystems are complex. If we try to describe an ecosystem simply by listing its parts, we will fail terribly! Ecosystems are defined by the interactions between living (biotic) and non-living (abiotic) factors in an area. They are even more complex as it is hard to draw a line between different ecosystems, because they are all interconnected; the conditions in one area affects the conditions on the other side of the world. Thus, when we talk about ecosystems we are actually talking about divisions of the biosphere, the zone in the Earth containing life. Each species on Earth is adapted to specific conditions and is distributed throughout the world depending on the environmental factors of different areas. The presence of a certain organism is largely determined by factors such as temperature, light, and availability of water, food, or nesting/breeding sites. Even though an abiotic factor may not influence an organism directly, it still may be extremely important. Light, for example, is not only essential for plants to perform photosynthesis. Most animals need light because they either consume plants (which need light to live) or they actually need light to warm up and to search for food. The same happend in reverse, as abiotic factors are influenced by the living organisms in the area. If an area contains many plants, carrying out photosynthesis, that will affect both the temperature of the area and the concentration of carbon dioxide in the air. Ecosystems with defined characteristics can be called biomes. The major biomes of the world are desert, grassland, shrubland, tundra, taiga, temperate deciduous forest, temperate evergreen forest, and tropical rain forest (EARJ's biome!). The relationship between rainfall and temperature with the distribution of biomes around the world is shown in the diagram below, taken from Andrew Allot's Biology for the IB Diploma. The interactions between living organisms themselves also defines an ecosystem. These interactions start within a population, which is a group of organisms from the same species living in the same area, at the same time. When more than one population is living in the same area, they from a community, which also interacts. These interactions can go beyond the limits of specific ecosystems as different communities, by definition living in different areas, interact with each other. Relations can be harmful or beneficial, and can sometimes even help one organism but harm the other. Below are some types of interactions and examples. 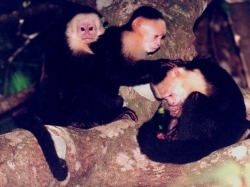 The capuchin monkeys to the right are displaying a series of interactions. The young individual is holding on to a parent, probably seeking help for locomotion. The parent, in its turn, is grooming another individual, removing its lice. In this case they are helping each other. Yet, interactions amongst population may also include competition for resources such as food, water, nesting sites and mates. A big part of interactions between species refers to feeding. If a species cannot make its own food, they have to feed on other organisms. As organisms feed on each other, food chains are formed. The image to the right shows a possible food chain at EARJ, with the jack fruit tree as the producer. Because most species feed on more than one organism, many food chains come together, forming the ecosystem's food web. A possible food web at EARJ is shown to the right. Food chains and food webs always start with a producer, which synthesizes organic matter by doing photosynthesis. These producers are then fed on by what is called a primary consumer. When consumers feed on producers the interaction is called herbivory. 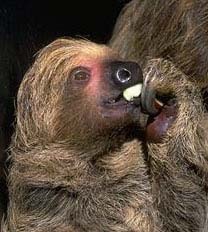 The image beside shows this interaction, as a sloth, a hervivore, is eating a fruit. When a consumer feeds on another consumer it is called predation. 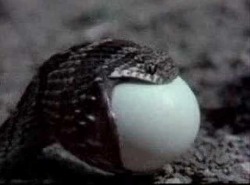 To the right, a jararaca is predating another consumer's egg. All predators are carnivores. Mutualism - a condition in which the relationship between organisms of different species benefits both. Although many believe that lichens are organisms in themselves, they are actually the result of an mutualistic interaction between algae and fungi. Fungi absorb mineral ions necessary for the algae and algae do photosynthesis, so provide food for the fungi. The picture in the right shows a lichen growing on a tree trunk. Parasitism- when an organism lives in or on a host organism, which is always harmed. 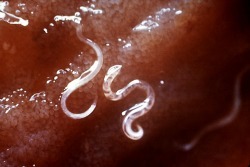 An example is the hookworm (shown right), a parasite that lives inside the small intestines of one of the most common species at EARJ: humans. Competition - this condition also occurs between members of the same species, as it is a competition for resources. If one organisms gets the resource, it will be lacking for the other one. An example would be channel billed toucans and scaly headed parrots competing for nesting sites on trees. The picture shows the two birds on trees, the parrot on top and the toucan on the bottom. Everything is connected! Whenever an organism eats another, the molecules of the consumed animal are metabolized and energy is transferred. However, every time energy is transferred some of the useful energy is lost. Remember: The laws of conservation of energy state that energy cannot be created nor destroyed, only transferred or transformed (as heat), and that every time energy is transferred or transformed some of the useful energy is lost. The example below came from http://www.slideshare.net/smullen57/ib-biology-option-g-ecology-6843789.